Spring is upon us and that means the tree planting season is too. Trees are vital to our environments; they provide individuals and communities with clean air, clean water, reduced cooling costs, safer neighborhoods, and a place to play and gather. But trees provide much more than that, they can help show how much we care for others, a beautiful living reminder of the legacy of a person. Arbor Day is this month, and it is the perfect time to plant a tree and illustrate our feelings for others. In 2017, the president of Rotary International, Ian H.S. Riseley, took the idea of tree planting to new heights. He launched an initiative to plant a tree for every Rotary member in the world. The Appleton Breakfast Rotary Club took this initiative to heart. The group was interested in planting their trees in Greenville parks, so they partnered with Tony Nowak, Greenville Parks, Recreation and Forestry Department Director. As the partnership and conversation about planting the trees grew, it was evident that there was an opportunity for these trees to mean more to the community. Cindy Reffke, who is part of the Rotary club, is also part of Prevent Suicide Fox Cities. She saw an opportunity for the trees that were going to be planted to help families heal. Prevent Suicide Fox Cities offers a support group for families of loved ones lost to suicide. The tree planting event evolved to allow for 23, 12-foot trees to be dedicated in the memory of a loved one lost too soon to suicide. 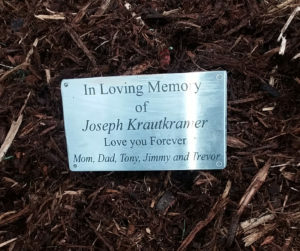 Each tree has a stainless-steel plaque installed in memory of those loved ones along with a message from their families. 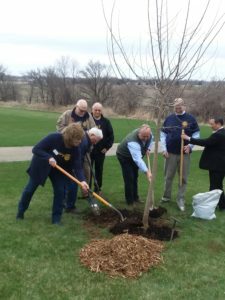 Many of the families and Rotary members got together at a planting event to honor lost relatives and appreciate the trees that were planted. Create your own loving memory on Arbor Day this year. Arbor Day is a time to plant and celebrate trees, this year celebrate not only trees, but also someone important in your life. Let a tree mean more. Find Arbor Day celebrations in your area, or let others know where your celebrating by viewing an interactive Arbor Day map, and get ideas for your own celebration. Grow a legacy with a tree this Arbor Day.